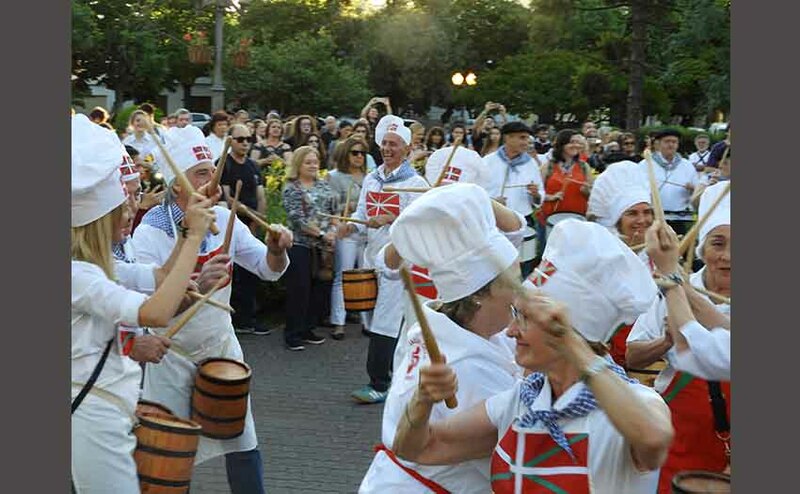 The excitement of celebrating the Basque culture and its vitality in Euskal Herria and the diaspora impregnated the streets and the daily life last week in San Nicolas de los Arroyos, just 250 kilometers northwest of Buenos Aires. With special intensity on the weekend, Basques and their descendants coming from all over Argentina and neighboring Uruguay, Brazil and Chile enjoyed the excellent local organizations. Beginning tomorrow, photo chronicle of the event on EuskalKultura.com. San Nicolas de los Arroyos, Argentina. It is a total challenge that was overcome thanks to the efforts and hard work of members and friends of the Euzkal Etxea Basque Club in San Nicolas. Euskal Astea, Semana Vasca 2017 concluded yesterday with the usual huge closing meal that gave good faith that Basque breath and palpitate strongly, in San Nicolas and Argentina, San Nicolas serving this year as the center and host of the one of the largest events in the Argentine Basque Diaspora. In addition to the Argentine Basque clubs, communities and individual participants, Basque clubs and Basques from Uruguay, Brazil and Chile, also joined in the festivities. For the first time, the group Itxaropen Gaztea from the Basque club in Santiago Chile attended and participated in the event. Some also remembered years ago the consistent participation of Eustaki Echeverrigaray, also from Santiago, a much appreciated participation form Chile. From the Basque Country, the official delegation was represented by the Secretary General of Foreign Action, Marian Elorza and the Director of the Basque Community Abroad, Gorka Alvarez Aranburu. Although the newest political representative was the Deputy in the French Assembley Jean Lassalle, who came after some controversial statements he made about ikastolas. Also from the Basque Country were artists, Michel Etcheverry, Xabaltx and Mikel Urdangarin. The latter was also thanked for his participation despite his leg injury that he is still recovering from. Basque singers like Mikel Urdangarin, or Michel Etcheverry organized tours around Euskal Astea. Urdangarin also performed recitals in Buenos Aires and La Plata. Xabaltx, announced a concert tomorrow, Tuesday in Buenos Aires, before his return to Europe (see schedule). Other novelties include the participation this year of Catalan representatives who were guests at Semana Vasca. Dantzaris from the Casal de Catalunya in La Plata participated with their own dances, in a sympathetic nod from the organization in light of current happenings in Catalonia. Some also stressed the Aurresku performed by a member of each group in their honor. There were several contributions, details, pictures taken of Semana Vasca 2017 in San Nicolas. All of which we will share beginning tomorrow with our usual series of articles and photo galleries that we will dedicate to the event this week.